Plumbing for a dishwasher and plumbing for a washing machine are very similar. 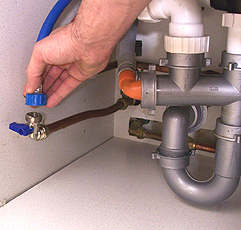 Replacing an existing one is a much easier task than starting from scratch for which you may want to get a plumber in. Remove the machine waste pipe. This will either be loose in a standpipe connected to the house waste pipe or pushed onto a spigot near the sink trap. ( it may have a screw clip holding it in place. Next, turn off the water on the water intake pipe/s which should have a small isolation valve to shut off the water. Unscrew them. You might be able to do with your fingers. If not use a footprint wrench. NB follow the instructions carefully. Most machines have transit bolts in the back which stop the machine damaging in transit. Transit bolts must be unscrewed as per the instructions before installation. Before plumbing in the new machine it's best to push the new one into place and make sure its level and doesn't wobble when you rock it. 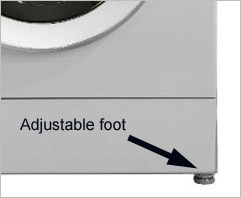 If it does you'll need to adjust each of the feet (usually the front left or right) which screw up and down. Some machines come with a little spanner which is the right size to adjust the feet and also tighten up the water hose. A lot of modern machines are connected to the cold supply only as machines these days are energy efficient and can clean on lower temperature water. This means you may only need to reconnect the cold and leave the hot pipe shut off. 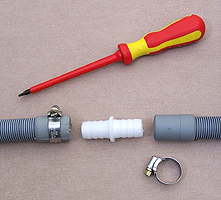 The flexible rubber water pipes have easy to fit plastic couplings with rubber seals on both ends. Just make sure you get them on square. If its going on right it should be quite easy to screw on. Get it finger tight then give a little turn with a fitting spanner supplied or a footprint wrench to make sure it's completely water tight. Don't over tighten them as they are plastic and could crack. You can buy longer pipes if the ones supplied are too short. If you haven't got 13 amp socket handy you'll need to get a qualified electrician in. 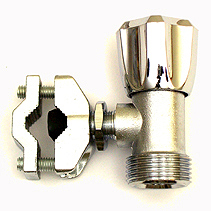 The water supply can be fitted directly to your copper water pipe/s with a self cutting connector. These are very handy and also easy to fit, you don't even have to turn the water off! 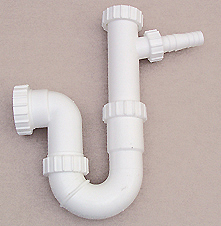 The waste either fits loosely onto a vertically positioned stand pipe and trap, or, pushes onto a spigot onto the water pipe, or, onto the sink trap with a screw clip. Check your new machines fitting instructions for any specific requirements. The important thing to remember is that which ever way you do it it needs to connect prior to a trap so you don't get drain smells coming back in. 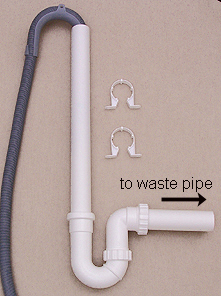 Here the washing machine waste simply hooks over an open stand pipe which is connected to a trap. 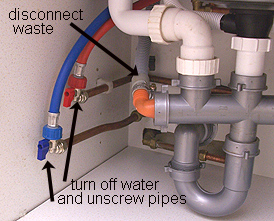 If you use this method you'll need to somehow connect the outlet of this to your existing waste pipe by. It depends exactly where that is, but it's fairly easy to achieve using push fit right angles and T-joints and a length of waste pipe. 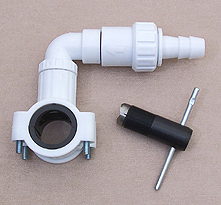 Alternatively you can simply replace the existing trap on your sink waste with a one with a washing machine spigot. The waste hose push fits onto it with a clip to make sure it doesn't slip of. Trap with spigot for washing machine. You can get one with a double spigot if you want to plumb in a dishwasher to. Or, you can buy a self cutting spigot which attaches directly to the waste pipe. Remember it needs to be placed prior to a trap. The waste hose is usually factory fixed to the machine so is difficult to remove. If you need it to be longer you can extend the other end with an extra hose and coupling. These need to be secured with screw tight hose clips.